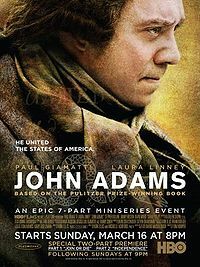 A few months ago, my husband and I curled up with a bowl of popcorn, our trusty Labrador retriever Max, and a little stack of DVDs–all from HBO’s much admired 2008 miniseries, John Adams. Loosely based on David McCullough’s best selling biography , the series started with the Boston Massacre on a cold March night in 1770, and ends with the death of Adams, the second American president, in 1826. The series was more my husband’s cup of tea than mine–I found all the constitutional wrangling extremely dull–but I loved the visual attention to historical detail. The producers had scrupulously avoided a common trap: prettifying the past. Indeed, the actors themselves looked as if they had been lifted straight from a William Hogarth painting, and the costumes struck me as letter perfect. Just this morning, I discovered why John and Abigail Adams’s clothing looked particularly authentic. In browsing on online, I found a fascinating article by Rachel Dickinson at Smithsonianmag.com about Thistle Hill Weavers, a small workshop in upstate New York run by textile historian Rabbit Goody. (Great name, eh?) Goody and her fellow weavers specialize in creating historically accurate reproductions of 17th, 18th, and 19th century fabrics. And it was Thistle Hill who created much of the homespun cloth for John Adams. This reminds me of when I used to take care of a very bright, very old lady. She always complained about the hairstyles in historic movies, particularly those where the hair is long and loose. It had never occurred to me before, but now I always notice it. Sometimes the men look so blow dried. Yes, I’m often struck by details like that, too, in films on historical subjects. One of the things that I often notice is actors’ teeth. They are Crest-toothpaste white, and all perfectly even and straight, just as the orthodonists made them. Queen Elizabeth I had black teeth from devouring so many sweets, but of course we never see her that way on the big screen.